Chris Tilton, president and co-founder of the Dewitt Tilton Group, will kick off the workshop with a talk on selecting the perfect location for your project and what unexpected road bumps you might encounter when you find it. Kim Thomas, director of operations for the Dewitt Tilton Group will then discuss the permitting process and zoning regulations. Space is limited. 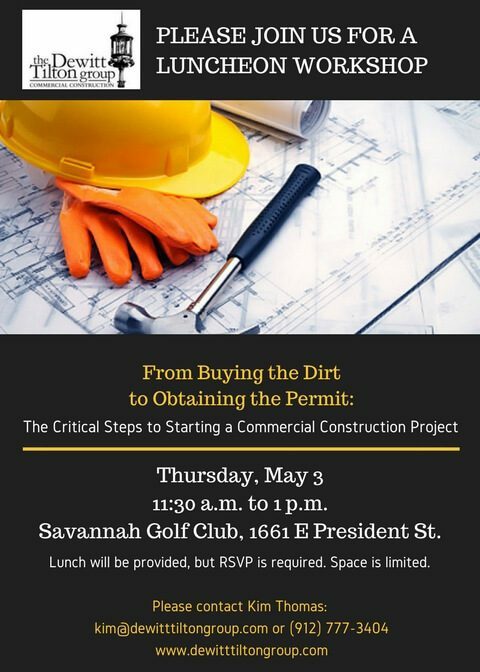 For more information on the luncheon or on commercial construction, call (912) 777-3404 or visit http://www.dewitttiltongroup.com/.